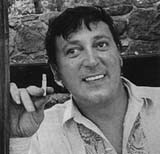 Discharged from the US Navy, Vincent began appearing on country music radio and came under the wing of disc jockey 'Sheriff' Tex Davis, who supervised his recording of a demo of "Be-Bop A-Lula." In May 1956, the track was re-recorded at Capitol Records' Nashville studio, with backing by the Blue Caps. Weeks later, "Be-Bop-A-Lula" stormed the charts, temporarily providing Capitol with their own version of Elvis Presley. Vincent's image was brooding, inarticulate and menacing and with such rock n roll authenticity he was not easily marketable in the USA. His second single, "Race With The Devil," failed to chart in his homeland, but proved successful in the UK, where he attracted a devoted following. Vincent rapidly lost the impetus that had thrust him to the centre stage as a rock n roll icon, due in part to unsuitable material and his own personal problems. His damaged leg, supported by a metal brace, made him increasingly frustrated and his alcoholism made him a liability. In the late-50's he relocated to England under the wing of Jack Good. He toured regularly but became increasingly disillusioned with his career. On 12 October 1971, he suffered a fatal heart attack. THE GREASE BAND was formed in 1966 as back-up to singer Joe Cocker but the original line-up underwent several changes over the ensuing years. Henry McCullough (guitar), Alan Spenner (bass) and Bruce Rowlands (bass) joined Chris Stainton in the group's best-known incarnation, but this unit split from Cocker in 1970 at the end of an arduous American tour. Spenner, Rowlands and McCullough were then joined by guitarist Neil Hubbard as the Grease Band embarked on an independent career. The group's brand of blues-rock was perfectly captured on their debut album released in April 1971 and they enjoyed a reputation as an exciting live attraction. Signed to EMI's progressive label Harvest the band fitted in well with the burgeoning UK country rock scene. Stainton remained an associate member, although Mick Weaver, aka Wynder K. Frog, subsequently augmented the line-up. John Pugwash Weathers came in for the defecting Rowlands, but the band broke up in December 1971 when McCullough joined Wings. ISOTOPE guitarist GARY BOYLE has had an interesting career, starting out in the early sixties playing the Hamburg Star Club and German club circuit, and then backing artists like the pop singer Millie and Dusty Springfield with whom he worked for a couple of years. However, it was a stint with Brian Auger's Trinity that would influence the jazz direction followed in Isotope. After a couple of years taken out to further his musical studies at Leeds College of Music, Boyle was in demand as a session player and recorded with a variety of jazz-orientated musicians like Keith Tippett, Mike Gibbs and Mike Westbrook. He also worked extensively with the Japanese percussionist Stomu Yamash'ta at the same time as drummer Nigel Morris, bassist Hugh Hopper and keyboard player Laurence Scott, all of whom subsequently became involved with Isotope. Gary Boyle formed Isotope in 1973 with Nigel Morris, bass player Jeff Clynne (ex-Nucleus) and keyboard player Brian Miller. Their eponymous debut album was critically well received, and the band gained equal plaudits for their live appearances. In 1974 Melody Maker readers voted Boyle number three British jazz guitarist and number six in the world. In the same poll Isotope picked up fourth place in both LP of the year and Small Group categories. College Event wrote: 'They keep one eye on rock so as not to lose you...and want you to dance'. By the time of the band's second album, 'Illusion', Hugh Hopper and Laurence Scott had joined and Isotope's reputation continued to grow fostered by a support slot to Gong. A third album appeared in August 1976 'Deep End' featuring a two-keyboard line-up (Zoe Kronberger and Frank Roberts) whilst Dan K.Brown came in on bass guitar. The band split as a result of management problems and the demise of British Lion Music, an offshoot of British Lion Films. Boyle recorded two solo albums for Gull Records, 'The Dancer' and 'Electric Glide'. He then ventured north, recorded three further albums 'Step Out! ', 'Friday Night Again' (released in Denmark) and 'Triple Echo' and mixed teaching with regular gigging around the region. PENTANGLE formed in 1967 inspired by Bert and John, a collaborative album by folk musicians Bert Jansch and John Renbourn. Vocalist Jacqui McShee, an established figure on the traditional circuit, joined Danny Thompson (bass) and Terry Cox (drums), both of Alexis Korner's Blues Incorporated. Their respective talents were expertly captured on 'The Pentangle', where the delicate acoustic interplay between Jansch and Renbourn was underpinned by Thompson's distinctive bass, and McShee's clear delivery. The band had an eclectic mix of blues, folk and jazz tunes in their repertoire including works by the Staples Singers and Charles Mingus. 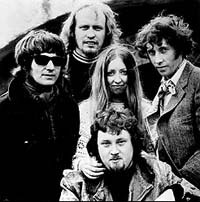 Pentangle enjoyed considerable success with their album 'Basket of Light' which included the theme song to the UK television series, Take Three Girls, 'Light Flight'. Ultimately, Pentangle was disbanded in 1972. There was no doubting their skills but the later albums and performances lacked inventiveness. Thompson went on to join John Martyn whilst Bert Jansch continued his solo career. McShee fronted the John Renbourn Band during the period 1974-81 and the original band reconvened in 1982 for a European tour and the album 'Open the Door'. With further line-up changes, the band continued recording, releasing albums in 1993 and 1994.